Before selecting a prevention program or developing a comprehensive plan, it is important for communities to determine what risk factors may be contributing to problem behaviors and what resources the community has available to address the problem(s). Assessment of risk and protective factors is used to identify the problem(s) of interest through archival searches for information available in existing community databases (e.g., poverty level; access to nutritious food and health care; child accidents and maltreatment; abandoned/substandard housing; access to alcohol, tobacco, drugs, and firearms; toxic exposure) and through surveys of community members to assess family, school, and community functioning. Assessing these factors can help identify the most pressing problems facing a community. Community prevention leaders can then select the targeted problem to intervene upon (see “Examples of Community Risk Assessment”). Below are two examples of risk and protective factor assessments at the school and community levels. The first example shows the results of surveying students within a high school about specific risk and protective factors. The resulting bar charts provide information on factors that can then be matched to specific evidence-based interventions. In this particular example, community coalitions identified specific factors that needed to be reduced (risk factors; top graph) or increased (protective factors; bottom graph) and selected evidence-based prevention interventions to address them. The graphs illustrate how communities compare with the average for all schools within the school district and the national average on measures of protective factors at the community, family, school, and peer-individual levels. 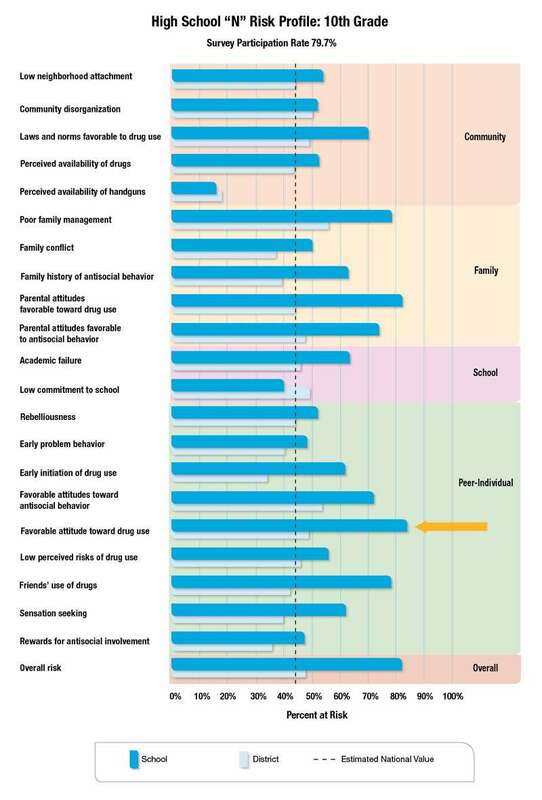 As shown in the top graph, for High School ‘N,’ ratings for several risk factors are significantly higher than those for other schools in the school district and the national average; the community selected one of these, “Favorable attitude toward drug use,” as the risk factor they wanted to work on decreasing for this school (yellow arrow). 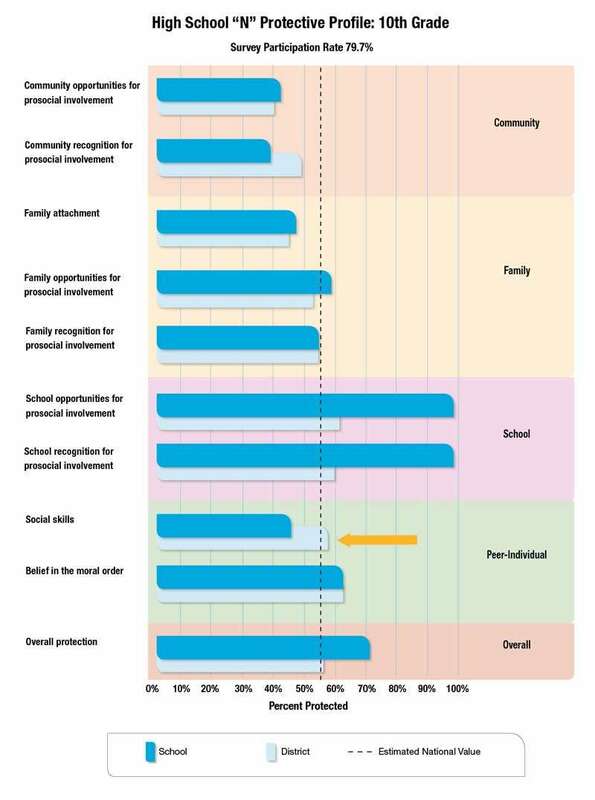 As shown in the bottom graph, the value for the protective factor “Social skills” in High School ‘N’ was found to be a significantly lower compared to ratings for other schools in the school district and the national average, and the community selected this as the protective factor they wanted to work on increasing for that school (arrow). This framework could be adapted for use with early interventions. For example, data could include archival measures of public health data on prenatal visits by mothers, birth weights, social service records on child abuse and neglect, and access to local and county support services. Risk and protective factors could be determined through national data sets that provide information at the community level as well as by parent reports of child and family behaviors. Text description - Bar graph comparing survey results from a school to the district average in risk factors for drug use at the community, family, school, and peer-individual levels and overall; favorable attitude toward drug use at the peer-individual level was 84 percent at the school level but only 49 percent at the district level. Source: Hawkins, JD. Preventing Teen Smoking, Drinking and Violence Community Wide: Results from the Randomized Trial of Communities That Care. Division of Epidemiology, Services and Prevention Research (DESPR) Seminar, National Institute on Drug Abuse, Rockville, MD; 2011. Text description - Bar graph comparing survey results from a school to the district average in protective factors for drug use at the community, family, school, and peer-individual levels and overall; social skills at the peer-individual level was 57 percent at the district level but only 45 percent at the school level. The second example provides a representation of substance abuse risk and protective factors within a geographic community area. Based on youth surveys and community records, 23 risk factors and 10 protective factors were examined in three neighborhoods of a California community. 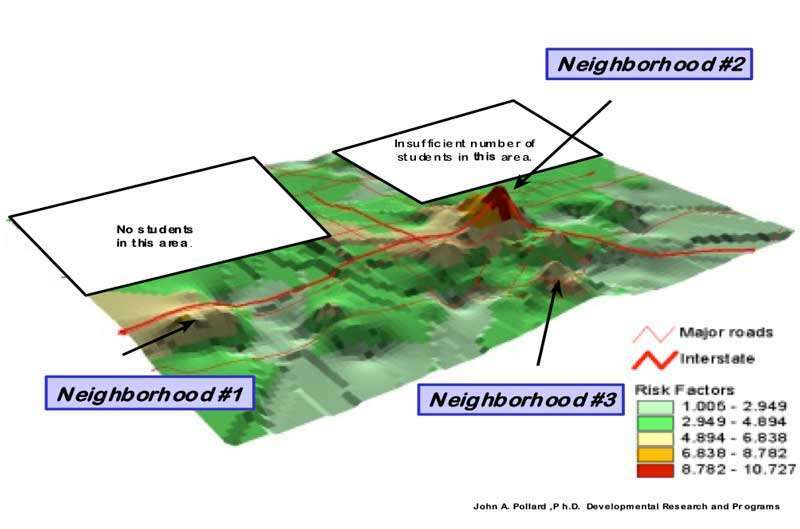 The peaks within the three neighborhoods in the figure below indicate elevated risk, with neighborhood #2 showing the highest elevation of risk factors. 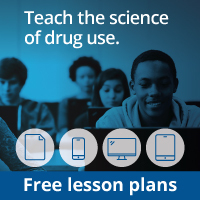 Communities can use this information to decide where to implement evidence-based substance abuse prevention interventions in order to address specific risk and protective factors. Source: Hawkins JE, Catalano RF, Arthur MW. Promoting science-based prevention in communities. Addictive Behaviors. 2002;27(6):951-976. Copyright ©2002, Elsevier Science Ltd. Reprinted with permission. Text description - Geomap image showing peak heights relative to risk level for three neighborhoods along with major roads and interstates; neighborhood 2 peaked with the highest risk factor level of 8.782 to 10.727. Identifying the subpopulation most impacted by the problems isolated through the community assessment of risk and protective factors will help determine the population to be targeted for intervention. The target population is defined based on characteristics of the individuals or group to be addressed by the intervention. 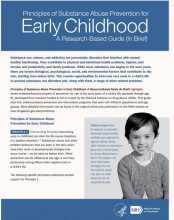 For interventions addressing childhood problems, age or developmental period is usually the most important defining characteristic. Other characteristics to consider in defining the target populations include: gender, race/ethnicity, health status, and socio-economic status. Another significant defining characteristic of target populations is level of risk. Risk assessments help in defining individuals and subpopulations at elevated risk due to internal, behavioral, familial, and environmental factors. One question that is sometimes asked is whether childhood prevention interventions need to be modified for implementation with populations or contexts that differ from the original research. Unfortunately, this question has not been adequately addressed through research. Minor changes to original program materials to make the people, contexts, and examples more relevant to a specific group have been found to have little effect on intervention outcomes. Generally speaking, significant changes to the intervention structure and content are not recommended, as there is limited evidence on how these types of changes will affect outcomes. When a target population or context differs markedly from those targeted in available science-based interventions, a new intervention tailored to meet that population’s specific needs (e.g., cultural or contextual needs) may need to be designed. An example of one such program, Family Spirit (described in “Research-Based Early Intervention Substance Abuse Prevention Programs”) intervenes with very young poor mothers on American Indian reservations (Barlow et al., 2006). Another adaptation that may need to be made is providing program support services to participants to make an intervention more accessible to them. Services may include transportation, care for other children in the family, snacks or meals, and compressed programming (e.g., offering fewer but longer sessions). Accommodations can lessen the burden associated with attending a program, help to build social support among members of the intervention group, and help keep participants coming to the program. Collecting data before, during, and after the evidence-based intervention is implemented at the local level is important as it allows the implementer to assess whether the intervention is producing effects similar to those in the original research and, if not, to help in determining why. It helps community prevention leaders as they decide on next steps in maintaining the focus on the most important risk factors to address for developing a comprehensive prevention plan.